The Digisonic® SP Binaural is unique. It is the only implant dedicated to binaural stimulation for adult patients. Unlike having two separate implants, one in each ear (bilateral implantation), the Digisonic® SP Binaural integrates two electrode arrays into one single implant allowing both cochleae to be stimulated simultaneously and synchronously to produce a single stereo sound. 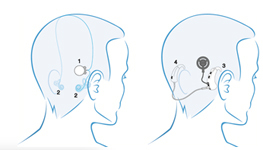 The Digisonic® SP Binaural implant includes an internal receiver (1) connected to two electrode arrays (one short (2), one long (3)) each with 12 active electrodes. The Digisonic® SP Binaural is associated with an external processor (3) and a contralateral microphone (4) which are linked via a connection cable. Saphyr® is intuitive to use and comfortable to wear. Use the single program selector to select the best program for your sound environment. The single selector controls both ears. And Saphyr® is designed for comfort. It features an ergonomic design that works with the natural shape of the ear, and it is also light and discreet. A compact contralateral microphone (worn on the opposite ear) is discreetly linked to the processor, providing the processor with the acoustic signal from the other ear. 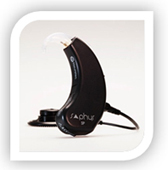 The Saphyr® processor analyses the microphone signals coming from each ear separately but synchronously and sends the appropriate stimulation to the left and right electrode arrays for true binaural hearing. Neurelec has developed CRYSTALIS, a new signal processing strategy with the aim to produce the most natural and sensitive hearing possible. CRYSTALIS captures the high definition signal, analyses it and then re-synthesizes that sound into a faithfully restored sound environment. CRYSTALIS signal processing combined with the Saphyr® behind the ear processor enables you to hear quiet sounds and understand lower levels of speech than was previously possible. Binaurally implanted patients report significant improvements in their quality of life. They feel safer, less stressed and more comfortable with sound perception and conversation. Enjoy every life event more fully, whether having a conversation over dinner with friends or participating at a conference, the Digisonic® SP Binaural implant will give you the advantage of confidence. With monaural implants you cannot tell which side of the head a sound is coming from but with binaural implants localizing sounds is easy and natural. With the Digisonic® SP Binaural, since both ears are implanted, you will always get the benefits of the ‘‘best ear’’. Furthermore, patients with both ears implanted can often show greater speech intelligibility than with just the best ear. The Digisonic® SP Binaural requires only one processor with single program selection and one auxiliary input (accessories) that is routed automatically to both ears. And the Digisonic® SP Binaural implant has the same battery-life as a unilateral implant, using only two batteries. Recent studies have indicated that bilateral cochlear implantation enhances speech perception in noisy environments over single implants.